The Yellowstone. A scenic beauty, majestic, stirring and rich in history. Starting in Wyoming, the Yellowstone River winds through the Paradise Valley in Southwestern Montana with the Absaroka Mountains as your backdrop. 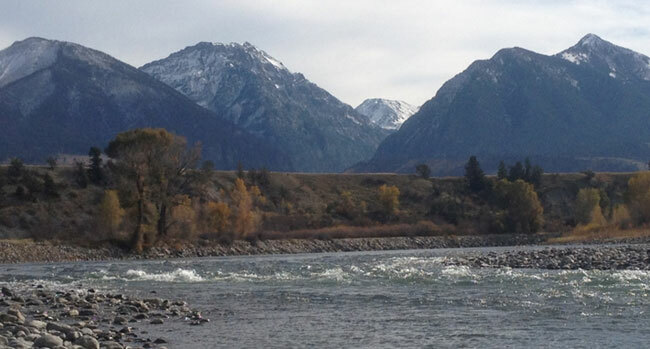 The Yellowstone River is one of Montana's largest rivers. 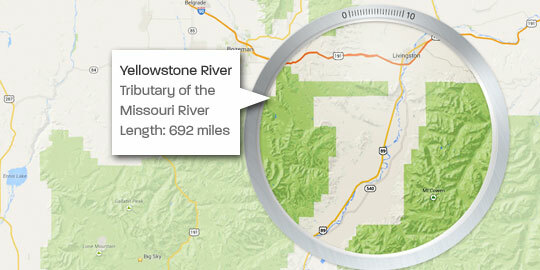 The Yellowstone River is the longest un-dammed river in the lower 48. Flowing for 680 miles, we concentrate on the fly fishing the first 100 miles from the Yellowstone National Park boundary to the town of Columbus, MT. You cannot find a river more diverse in the immediate area. 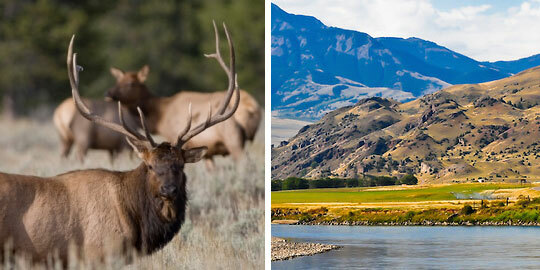 The Yellowstone River is divided up into many different sections that have their own characteristics and emotions. It is difficult at times to keep your eyes on the water without being distracted with the surrounding scenery and unique Yellowstone country wildlife. 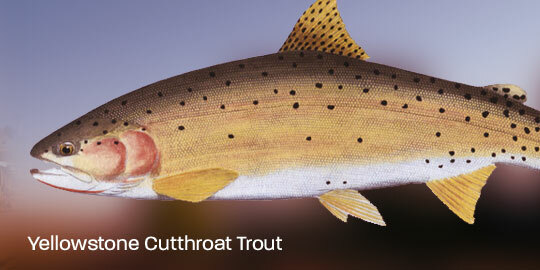 The upper Yellowstone River has an abundance of cutthroat trout, generally ranging in size up to 16 inches. Eager to take a dry fly and bolt away from the boat, this area is ideal for plenty of action. 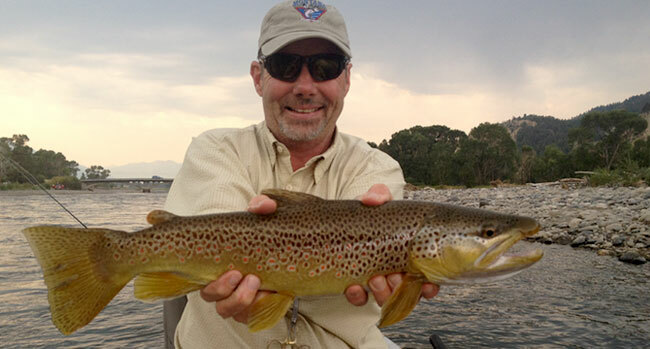 As you get closer to the town of Livingston, MT, the average fish size increases, and you tend to catch more rainbows and browns in the faster water. Below the town of Livingston, the river seems to broaden out even more and slows down again. Here lie the "pigs." The numbers on this section of the Yellowstone River are not there in mass, but some of the biggest fish of summer get their photo taken in the lower section, with big streamers or hoppers protruding from their mouths. Diverse and ever changing, the Yellowstone as you move below Big Timber, Montana is filled with channels and tributaries to increase the river flow. As we float it is not uncommon to park our boat alongside a channel that holds large, slumbering Bows and Browns eager to take our well presented fly. The Yellowstone river is at its lowest point during the winter months. During this time period it is the most conducive to wading. 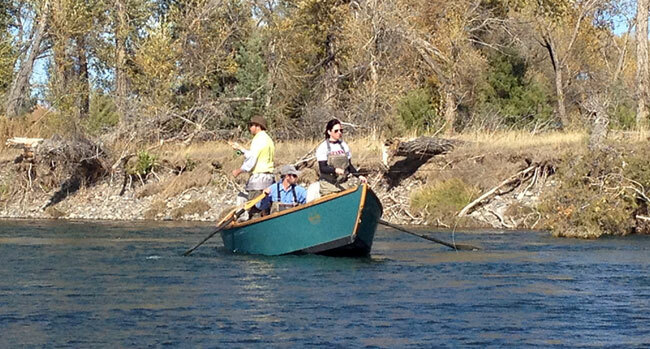 Accessing the Yellowstone river from one of the many state owned access will give you plenty opportunities to fish. Winter fishing on the Yellowstone river consists of primarily nymphing with stoneflies and basic attractor nymphs. 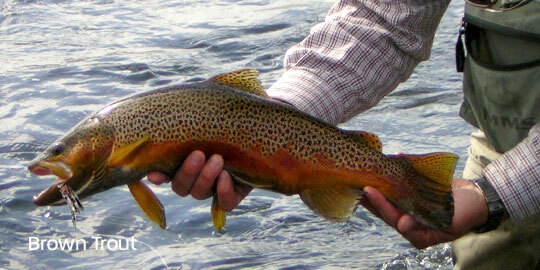 On the warmer afternoons you will find fish rising to midges in the Yellowstone river's back eddies and soft currents. You would be well advised as to check the weather report during the winter as Paradise valley is well known for extreme windy conditions throughout the winter. Once the water temperatures start to warm up, the Yellowstone river's action heats up. Starting in early April the Baetis or blue winged olives emerge. The trout feast upon this first major hatch of the spring trying to regain loss energy supplies. The Yellowstone river also experiences many great caddis hatches, such as the "Mother's Day Caddis hatch" which occurs in the month of May. This blizzard hatch of caddis can make the Yellowstone's trout rise from bank to bank. Spring is a great time to fish the Yellowstone river as the trout are extremely hungry coming out of the cold Montana winter and the fishing continues to get better and better each day until run off starts. The Yellowstone river is one of the last rivers to drop and clear up from spring runoff in our area. Generally by the end of June the river is safe enough to float and fish. Like the Madison the Yellowstone River has a great Salmonfly hatch. These gigantic stoneflies crawl up the banks, split their nymphal husks and emerge as huge, clumsy fliers. The trout crave these giant meals and they will move many feet to eat your dry fly. Once the salmonfly hatch is over on the Yellowstone river then the typical mayfly, stonefly and caddis hatches are predominant. Late in the summer the terrestrial fishing starts and is some of the best grasshopper fishing in the area. Once fall sets in and the cottonwoods along the Yellowstone river start to lose their leaves it is time to break out the big guns. A majority of the trophy trout are caught during this time period. Fishing with a 7 or 8 weight rod and a sink tip line or floating line it is time to pound the banks and pull big streamers in front of the noses of trophy brown trout. The brown trout turn up their aggression in the fall as they begin to spawn. Covering as much water as possible and keeping your streamer in the "zone" is the key. Fishing 4-6 inch streamers is not uncommon. 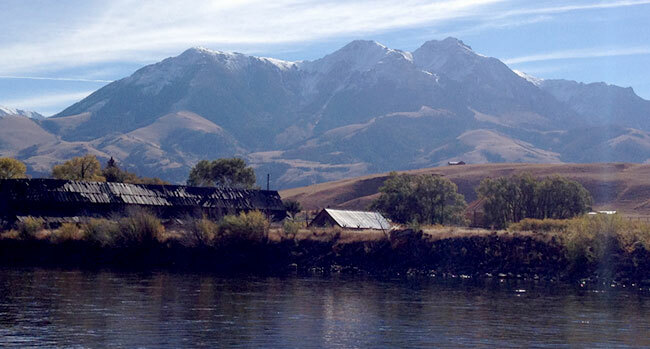 Fall on the Yellowstone river is your time to catch that trout of a lifetime. 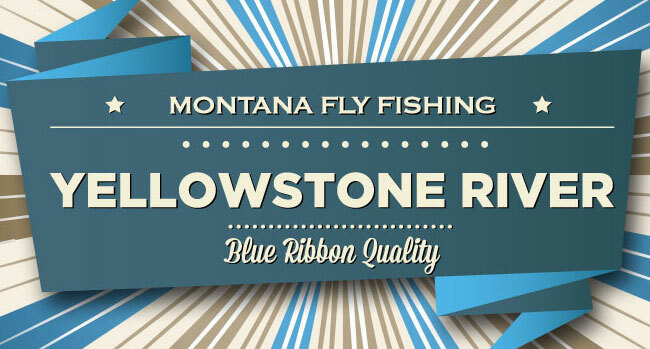 There are many appropriate flys to choose from on the Yellowstone River. These three flies are focused around a springtime hatch. Our first pattern has been around for a long time. The Royal Trude is a great attractor fly for most of the season. I like to fish it for this Mother's Day Caddis Hatch specifically because of how it stands out from the naturals. When the water is covered with caddis one of the biggest problems is finding your fly on the water. This pattern gives off the perfect silhouette but yet is easy to see among the crowd. It also provides enough buoyancy to float a dropper fly beneath it. The Royal Trude doesn't imitate any specific hatch but can be used for many down wing patterns such as Yellow Sallies, Caddis and Spruce Moths. The next fly is the $3 dip. Much like its cousin, the serendipity, this fly can be tied in various colors to imitate various caddis. It is an easy fly to tie and rusty brown and olive colored thread are my favorites. With or without a beadhead this fly is a great pattern when you expect a caddis hatch. It's easy to tie and being durable makes it a winner in my book and earning space in my box. The last fly is the girdle bug. The girdle bug, also known as rubberlegs, is a staple all year long in most of area rivers. Tied in various sizes and colors, all of our freestone rivers and streams have an ample supply of stonefly nymphs. During high water the fish will be pushed up on the banks and that coincides with salmonfly and Golden Stone hatch. Stoneflies vary from 1-3 inches long, crawl to the rivers bank where they then climb out of the river to split their nymphal husk and become huge winged adults. Trout will gorge on these nymphs and their dark color will stand out even in stained water.